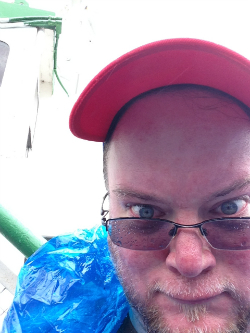 Me, today, on the Maid of the Mist boat thing. New York side, of course, what, you think any of us haz our passports updated? I had just gotten soaked by Niagra Falls here, soaked in my hair, my face, my goggles, everything. These Falls are an awesome Falls. The boat, I had forgotten, as it’s been decades since I boarded it last, the boat sails right into the mouth of the Horseshoe, even from the Amurkin side. 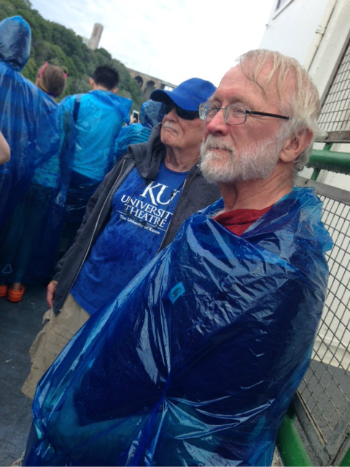 My party chose to be on the upper level, front, so we bore the brunt of the choppy waters and the rainy, thick mist. I can’t help but wonder if you get a better perspective below deck. 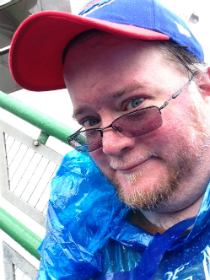 How nice that the blue in my Bills cap and the blue in my disposable poncho so nicely match the blue on the ol’ 8WK here. How nice. Blue blue blue blue blue blue. So much blue you could barf. Stalwart sailors. From left, my Uncle Mike and my Dad. Both soaked and awed to the gills. I think in the throng behind them is our token youngin, cousin Jordyn, who was a lovely travel companion. So yeah, it was exactly like this. We’d stopped in for lunch at the Pearl Street Grill & Brewery in Buffalo, where I had a lamb burger, which was delicious. After our adventure here, we returned home and watched Silence of the Lambs. So, accidental theme day. FTW. Uncle Mike would have my hide if I mentioned him in a blog post and did not plug his Web site: Please visit sanders-warren2016.com and learn about candidate Bernie and you can even buy a bumper sticker. It’s one site started by one determined man and it’s become something of a big deal. “Mr. Burns: your campaign seems to have the momentum of a runaway freight train. Why are you so popular?” (Lisa Simpson to candidate Montgomery Burns at a planned press event, 1990). “So in June, right before you announced, you were at one percent. In July, after you’ve announced, in the last six weeks, you are in first place with 19 percent. Why do you think you’re resonating so quickly in the Republican field?” (Chuck Todd to candidate Donald Trump on Meet the Press, this morning).